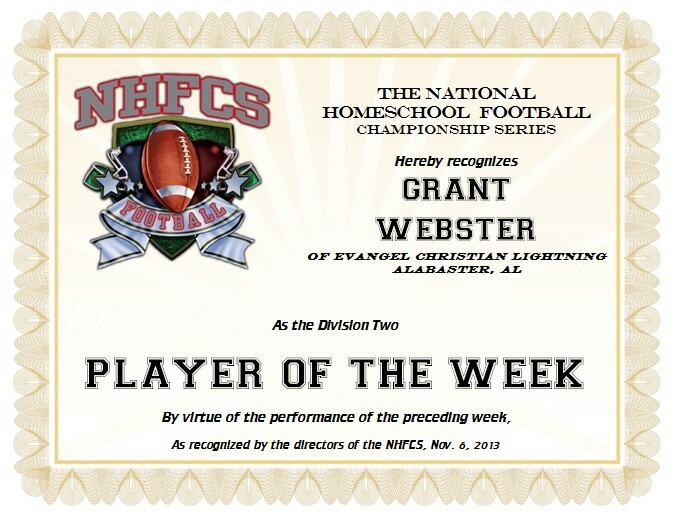 National Player Of The Week - Division 2 honors for the week of November 2nd, go to Grant Webster, of the Evangel Christian Lightning. Webster, a senior member of the Evangel Christian Lightning made the difference for the new #1 Homeschool team in division 2 football. This NHFCS Spotlight Game of the Week was everything expected, and a bunch of screaming fans will remember it for a lifetime. 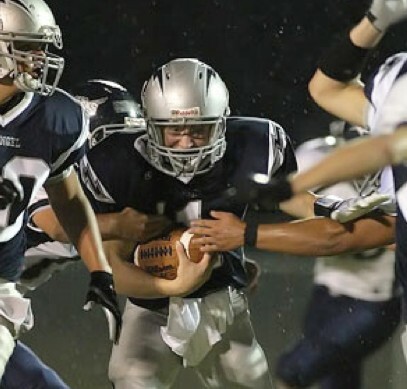 The #2 Lightning were hosting their rivals, Hope Christian Eagles, of nearby Pelham, AL. Both teams came into the game as undefeated giants of Alabama prep football. A true leader on both sides of the ball, Grant compiled a team-best 17 tackles. Yardage came at a premium for both offenses, but Grant came through when it counted, scoring 2 rushing touchdowns and one long reception for a 3rd. Turnovers were a big enough facter in this close game, and Grant's recovery of an Eagles fumble was just enought to defend the home turf for the lightning. Congratulations Grant! An honor well-deserved! This typifies the kind of young man we all know you to be! Thank you for your commitment to excellence on the field, and more importantly in your Christian character and service. Grant, Papa and I are so proud of the young man that you are! This, nor anything else, goes to 'your head'; you just do your best in whatever you are doing! This and other recent awards make our heart swell, but when we see you, you will be 'the same ole Grant' that we have known for 18 years! And that is part of why we love you so!! But no award you have received surpassed the news when you were baptized into our Lord several years ago!! We love you with all our being.